Having not attended a Q & A session for my online class all semester, I finally made it to one at the ungodly hour of 4:30am. I had to attend at least one and it was good to be able to be there and communicate with James and to be able to thank him. I have come on leaps and bounds having taken the class. 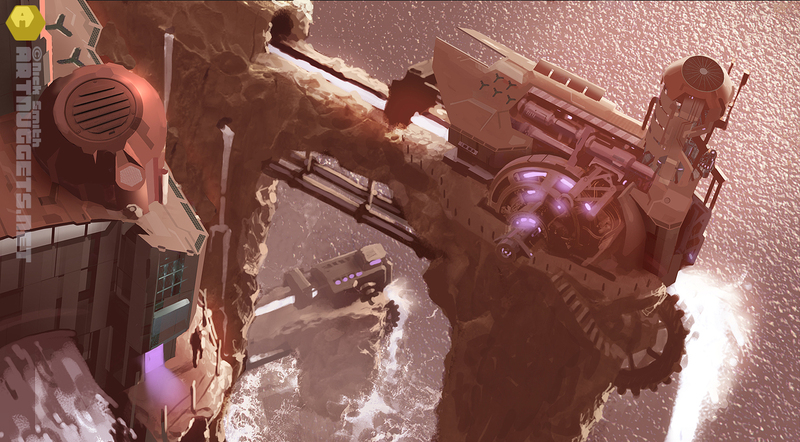 It has given me a lot of confidence in tackling environments and more ambitious concept pieces than I thought it would. Well worth it. So here are the final pieces. With the top one I added a few more dragons in front of the mountain side so they would look as if they were swarming over it more. 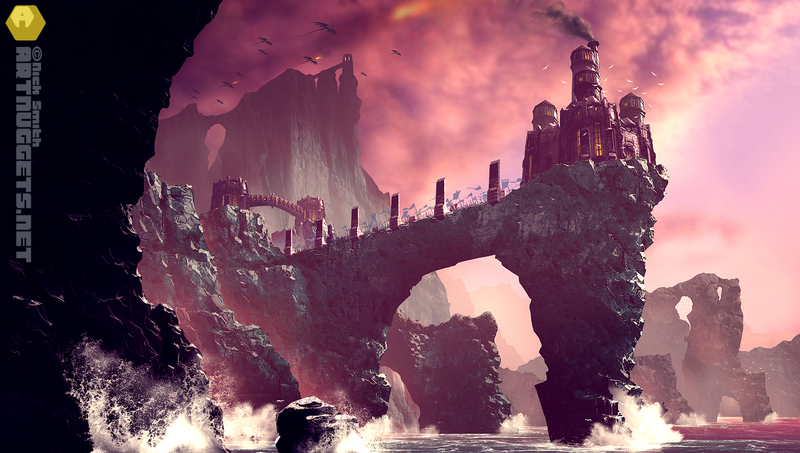 I also pushed the castle back a bit by adding a little haze to the upper reaches. The bottom pic went through a more drastic overhaul since the last update. I implemented the advice that was given, sharpened up a lot of areas and included the seagulls which gives the whole piece more depth. This is one of my favourite images. After spending the whole weekend playing the original World War 2 game Medal of Honour on Playstation 1 back in my Uni days, I came up with this image of three nazi stormtroopers are making their way through the driving snow in a determined fashion. It was created before the advent of my getting photoshop, using pencil and paper initially, before laboriously inking everything in with a humble felt tip pen. 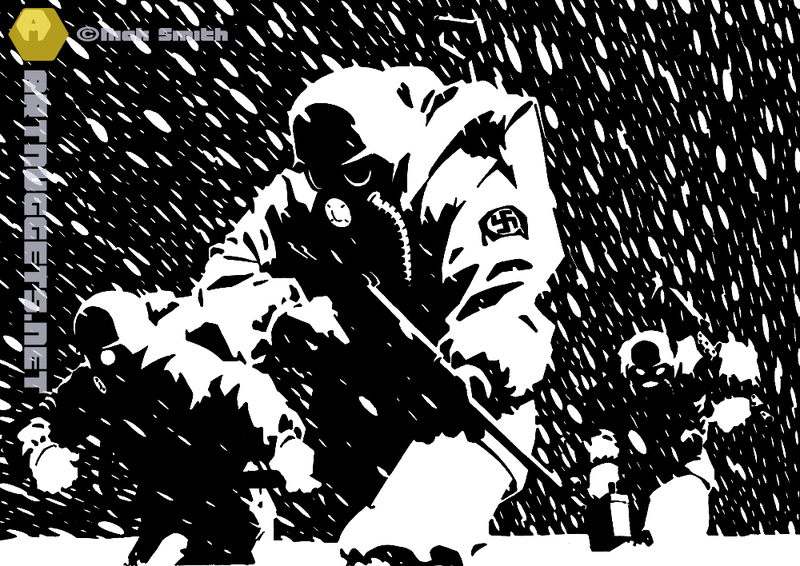 Having drawn the soldiers first, I originally drew the snow circular, but tben struck upon the idea of drawing them elliptical, which allowed me to suggest the direction and force of the snow storm and give the image it’s power. 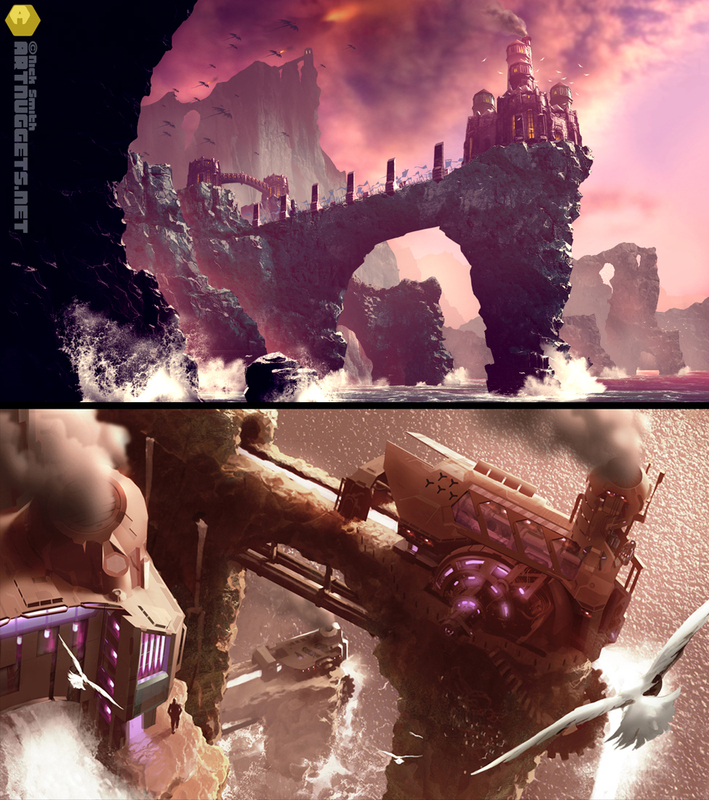 Week’s six and seven of the Environment Design 1 course focused on refining a one design each from week 5’s thumbnails. The use of photographs, to help not only texture the image, but also as a way of creating new shapes and designs was explored. The top image is Week 7’s effort. I felt I owed the course a real solid effort, since last Week 6’s image (bottom) coincided with my trip back to Australia from the UK and I wasn’t able to give it the attention it deserved. I went with a more fantasy style image, with a castle stretching out to the sea being marched on by an army. I took the thumbnail and pretty much painted it again from scratch, making use of the painting on top of photos idea. The bottom image is Week 6’s effort. This was probably the most successful of the thumbnails from Week 5, and certainly the most intriguing point of view. I used photos in this one to enrich the mechanics of the water mills design. This image was going in the right direction, but I was unable to give it the attention it needed to really make it look finished. Perhaps I will return to it and finish it off in the coming days. A few years ago THQ/Relic’s Company of Heroes was the game of choice round these parts. Set in World War II, it was a superior RTS that gave special consideration to real tactics and had a fully destroyable environment, making it very atmospheric. 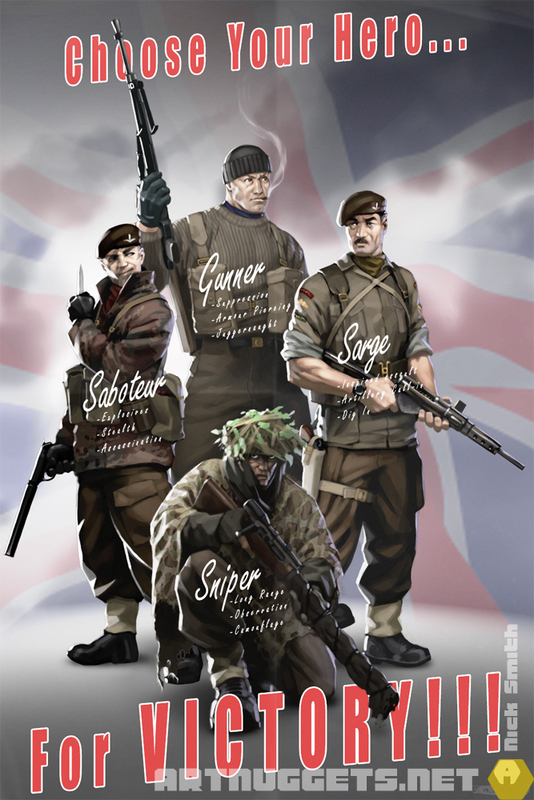 Inspired by that game, I came up with these Commando squad leaders, all with their own appearance, weapons and abilities, and tried to present it in a mock WWII style poster, with the idea that this would be what you see when selecting which nationality you wanted to play. This was painted in Photoshop from the ground up (as opposed to starting with a pencil sketch), which I rarely did at the time, and I consider it quite a milestone in my evolution as a concept artist. I remember thinking how simple the rim lighting was to do, yet so effective. Good fun!